Look, I have a confession to make: I am a big fan of replicas. Not the kind of awful, Fiero-based Lamborghini abominations you see in the “Other Cars” section of eBay. I mean ultra-rare specials built up from more pedestrian examples, like a regular 69 Camaro painted to look like a Yenko, or a 454 SS Chevelle look-a-like with an LS1 stuffed under the hood. Some originals are so rare and wonderful, it seems a shame to drive them the way they were intended: like you stole ‘em. 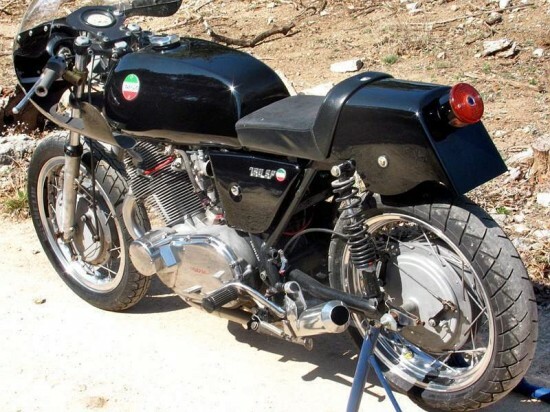 Based out of Breganze, Italy, the Laverda family started out making agricultural machinery, and this tradition of overbuilt engineering found its way into their motorcycle design. 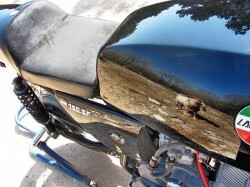 By the late 60’s, the company was developing a big-bore parallel twin. 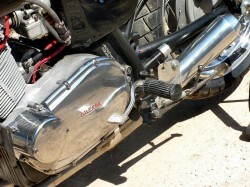 The Laverda reputation for heavy-duty engineering was upheld here: the bikes were solid, reliable machines, with five main bearings in the two-cylinder engine. 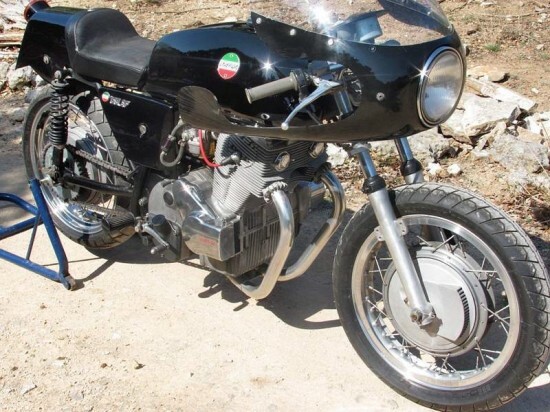 Parts not manufactured by Laverda were all chosen for their quality and reliability: Ceriani suspension, Bosch ignition components and a Japanese Nippon-Denso starter. Built to last, the machines were expensive, heavy, and stable, lending themselves to endurance racing. The ultimate evolution of this concept was the 750 SFC [Super Freni Competizione], first produced in 1971. Real SFC’s are as rare as hen’s teeth, but this replica has been rebuilt to approximate the genuine article as faithfully as possible, likely at a fraction of the cost. 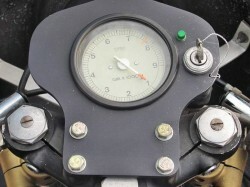 This bike has the classic drum brake and a large Veglia tach that looks very similar to the one found on 1980’s Moto Guzzis. That’s not a dig: I love the look. 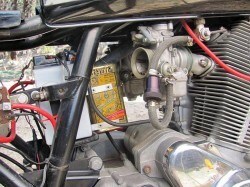 From the description, the bike appears to be running a total-loss charging system: that is there’s no alternator/generator on the bike currently, so it’s not really set up as a road bike. It would be fairly straightforward to convert it for street duty, but this bike is just begging to be used as a vintage racer.